The Swarovski 5821 crystal pear pearls are the perfect imitation to natural pearls. Made of a unique crystal core covered with an innovative pearl coating. 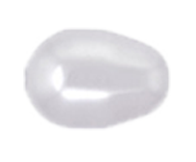 These pearls possess a flawless, silky, smooth, rounded surface.